The exhibition, "Roma Aeterna: Masterpieces of the Vatican Pinacotheca. Bellini, Raphael, Caravaggio," at the State Tretyakov Gallery in Moscow is sold out for the remainder of its duration, said the museum on its website. 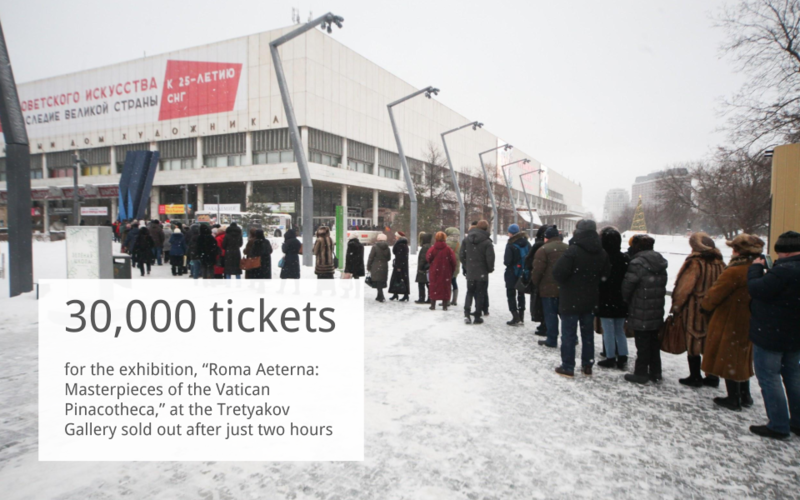 The Tretyakov earlier wrote on its VKontakte social media page that it was selling an additional 30,000 tickets for the exhibition via its official website starting Jan. 13. The exhibition originally opened on November 25, and includes paintings by Caravaggio, Raphael, Giovanni Bellini, Guercino, Pietro Perugino, and Guido Reni. These masterpieces are very rarely displayed outside the Vatican. The exhibition runs until Feb. 19.